Beach Clubs have become very fashionable nowadays. 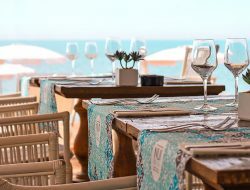 They are the perfect place to enjoy the beach in a different way and some of them are also beachside restaurants. 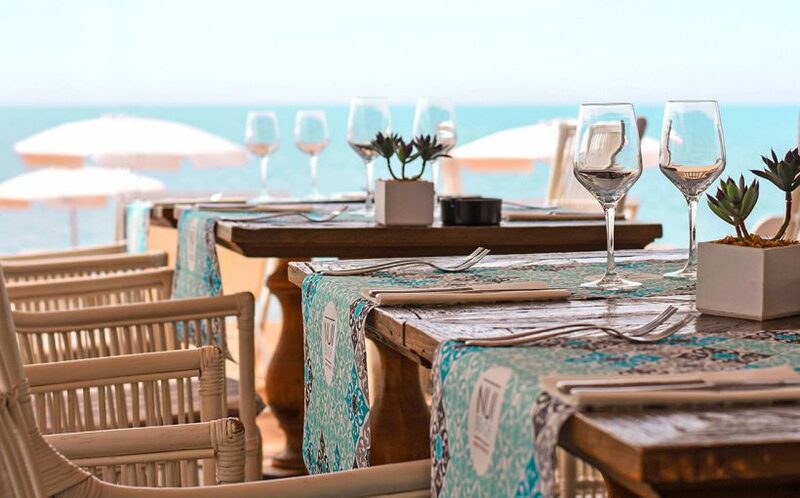 In this post, I will tell you about my experience at NUI Beach, a Mediterranean-Style Beach Club at Calella’s Beach Playa Grande. I go regularly to NUI Beach, since it belongs to GFH Hotels, the company that I work for. Normally I go there in the afternoon with friends or colleagues. 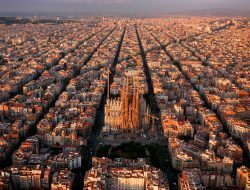 In this case, I went there with my sister, as she was visiting Barcelona. We have called them to make sure that we get a table for two at lunch time. There is usually no trouble for booking a table either for lunch, dinner or to have a cocktail in the afternoon. 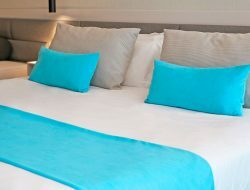 On the weekend, I recommend you to book in advance as there is a lot of demand. We arrived at the Beach Club around 11.00 am. As it was early, we decided to use the sunbeds and umbrellas service provided by the Beach Club. A sunbed, an umbrella and a towel has a package price of € 10 per person, for the whole day. We took two loungers directly at the seafront to enjoy the lovely views. 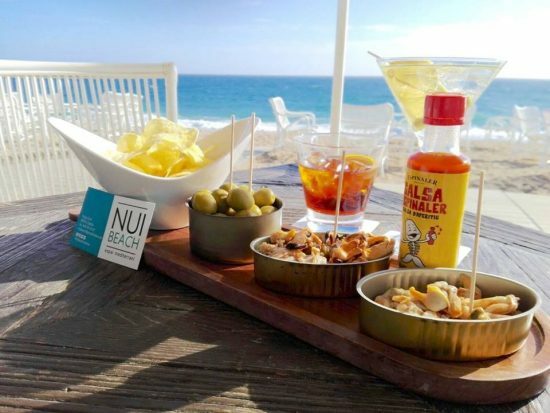 Next to each lounger, there are small tables to place your beach bag and there is also the Snacks-Menu to order directly from your sunbed. The menu is quite varied as there are drinks, sandwiches and burgers, snacks, salads and cocktails, among other things. 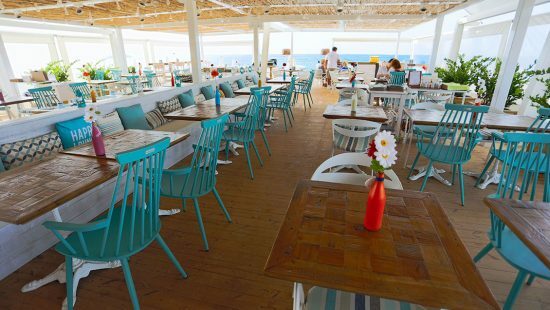 This is so comfortable, as they bring you everything to the sunbed and you can enjoy your drinks and meal chilling directly in front of the sea. Around 2.00 pm we could already smell the grilled meat and became hungry. We went inside the restaurant to get the table we have booked. There we found the menu in several languages, probably because Calella is a very touristic city (especially in summer) and almost all the restaurants have the menu in several languages. We ordered grilled octopus with potatoes and bread with tomato, as a starters. I have never tried grilled octopus before and it was certainly a great option. It had a delicious grilled flavor! If you go to the NUI Beach do not forget to try this dish. As a main dish, we ordered one of the star dishes from the restaurant: “Arroz a la llauna” with shrimps. 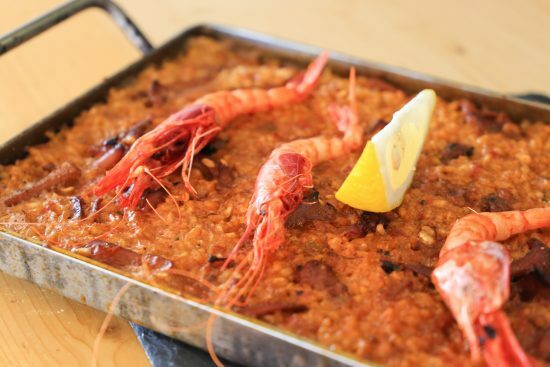 We have read very good reviews on TripAdvisor about the rice dishes on NUI Beach, so we decided to try one of them 🙂 This dish is very curious as it is like “paella” but with a square base. I recommend it, as the rice was very tasty and with a lot of flavor. As a dessert we ordered a Green Tea Biscuit with coconut, passion fruit and yuzu mouse. The waiter explained us, that “yuzu” is a type of citrus that is very used in Asia and it is similar to an orange. They also have other desserts that look very good and I am sure that they also taste delicious, as for example White Chocolate Coulant. NUI Beach has lovely Mediterranean Style. It is a very cozy place and the staff is very friendly. The decoration is modern and with some vintage details. 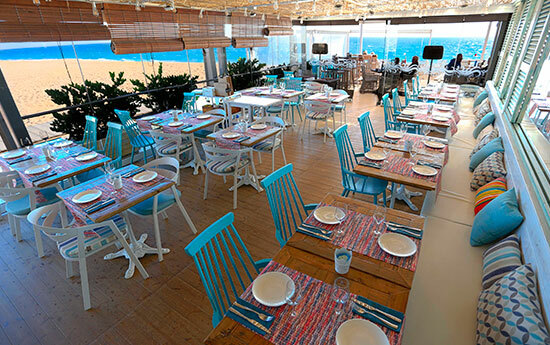 The restaurant is divided in different areas: a dining area which is divided into 2 zones with sea views (the whole restaurant is covered with glass windows so you can see the sea while you eat), a covered terrace, and outdoor terrace and the sunbeds area. The atmosphere is very chilly and they usually have good music. Sometimes they have live music, especially on the weekends. If you are going there by car, it is quite easy way to get to NUI Beach from Barcelona or nearby towns. Calella has access to the C-32 Motorway and is basically a straight road from Calella C-32 Exit to the Beach Club. It takes about 45 min. by car on the C-32 to get there from Barcelona. For parking there is usually no problem, just in front of the restaurant there is a “Blue Parking Area”. This parking has a cost on July and August, but the rest of the year it is for free. Furthermore, there is another parking very close to the restaurant that is free of charge all year round. This one is by the train station, and just 4 minute walk from the restaurant. 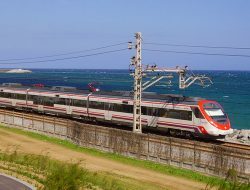 If you want to go there by train, it is also easy to get to NUI Beach, which is just 5 minute walk from Calella’s Train Station. Very close to the restaurant is the Hotel Volga, about 5 min walk. If you come to spend the weekend in Calella the Hotel Volga has a nice view to the sea. NUI Beach is open almost all year round; usually it opens from 9.00 am to 1.00 am during summer and fall / and during winter season from 9.00 am to 6.00 pm. On the Facebook page and TripAdvisor you will always find the updated opening hours. 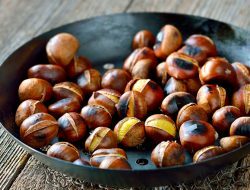 On these pages you will also be able to see photos and videos of the dishes, events and read reviews of the clients. On their Instagram page you will also find many photos. 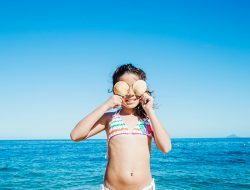 I hope you liked this post, and if you are going to NUI Beach or you have already gone you can share your experience on social media.